The Project’s second Pilot Survey* took place in Meonstoke at Shavards Farm. Over the last 25 years this location has witnessed several important excavations and fieldwork projects. The farm boasts an early Anglo-Saxon cemetery and middle Saxon settlement, but is most famous for the excavation of a Roman aisled building during the late 1980’s and early 1990’s, which uncovered part of a fallen wall. The wall was so well preserved that it was possible to reconstruct what the front of the building looked like; a section of the wall was lifted and is now on display in the British Museum (http://www.britishmuseum.org/explore/highlights/highlight_objects/pe_prb/s/fa%C3%A7ade_from_a_roman_building.aspx). The excavation of this building also produced early Saxon settlement features, in the form of a sunken-featured building and a group of post-holes that were cut through the top layers of the Roman building. That the Saxon evidence was directly associated with the Roman building is significant and raises the question why the site was reused. A community project was planned to investigate this issue, in addition to finding out more about the Roman phase. Did the building belong to a wider site, a villa perhaps? 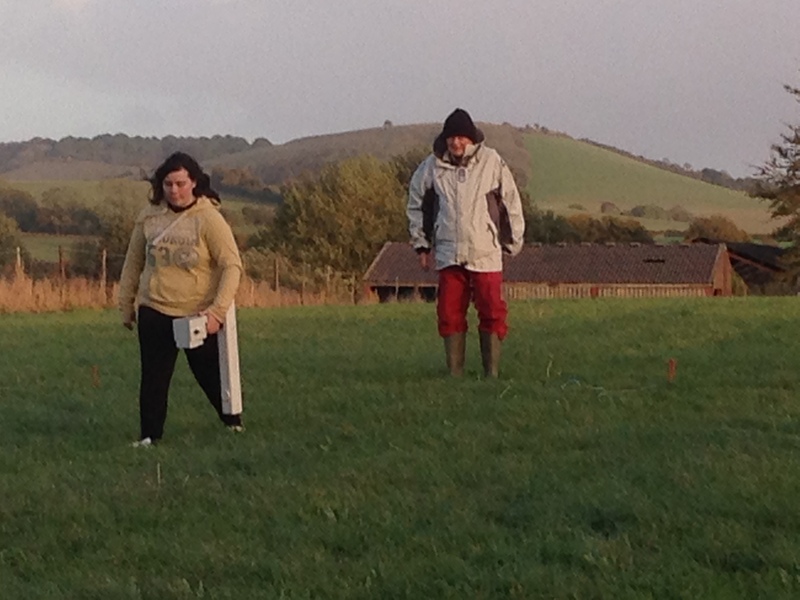 As at Corhampton, the fieldwork was also used as an opportunity to introduce and train local volunteers in non-intrusive archaeological techniques: magnetometry and resistivity (two forms of geophysical survey) plus metal detecting. We were pleased to welcome back several of the volunteers from the Corhampton survey [hyperlink to this summary]. 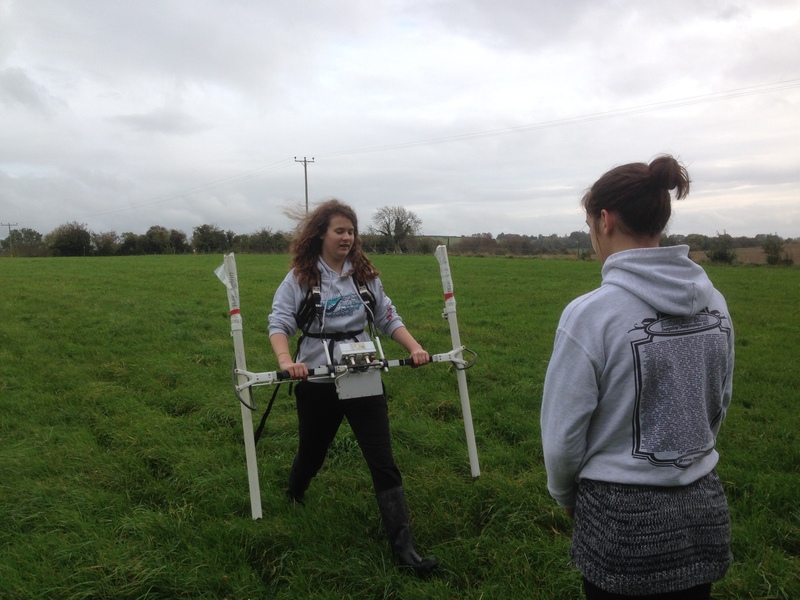 On the Friday, Rachel and Jen from Wessex Archaeology provided training in the use of the geophysics equipment, while on the Saturday they were joined by Maisie and Sophie from the University of Winchester. Project members, Mike and John, led the metal detecting. Work commenced on the Friday and although the weather forecast was rather ominous it remained mostly dry and progress was excellent. After a brief introduction to the area and its Roman and Saxon background the volunteers divided into groups. One group set about gridding out the area within which the geophysical surveys would take place. The importance of having accurate grids that acted as the recording framework for the surveys was explained to the volunteers. The second group were metal detecting and full instructions were given on their use, e.g. interpreting the different signals that metal objects produce and how to locate objects effectively by adopting a systematic and rigorous approach. An area covering the location of the original excavation, plus a stretch of ground to either side of it was gridded out (60x40m divided into six 20m squares) and both magnetometry and resistivity survey was carried out. Two types of magnetometer were used: a Geoscan FM-36 fluxgate gradiometer (Fig. 1) and a Bartington Grad601 Single Axis Magnetic Field Gradiometer System (Fig. 2). The latter has twin probes and can collect twice as much data compared to the older Geoscan. Magnetometry is based on the measurement of differences in the earth’s magnetic field. Metal artefacts and materials that have had their properties altered through heat, such as brick, will cause disturbances in the earth’s magnetic field and can be detected. In this way archaeological features, such as brick/tile structures, hearths and spreads of disturbed building material, as well as pits and ditches that are filled with ceramic building material, for example, can be detected. The resistivity survey used 1m intervals and transects and a RM15 resistivity meter was used (for a brief explanation of this technique see [hyperlink to Corhampton survey]. Very good progress was made and the whole area had been surveyed by mid afternoon. The preliminary results were very encouraging: a large linear feature was clearly visible running in a NE-SW alignment throughout the area (Fig. 3, D). It was decided to survey some additional grids with a view to identifying further evidence for this feature and to gauge whether it continued on the same alignment or turned in a particular direction, as such information could help interpret its function. 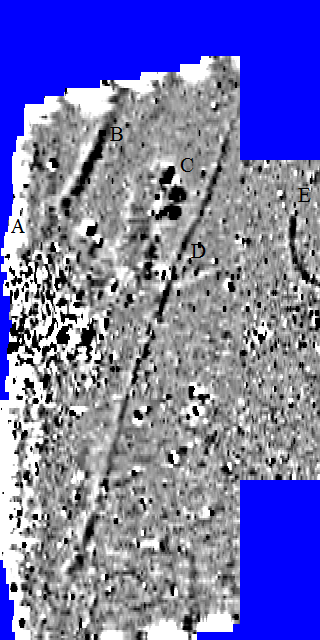 The results at the end of the day showed that it continued straight through the area and followed the same alignment as the Roman building. Metal detecting took place outside of this area to ensure that there wasn’t interference between the various types of equipment. It was hoped that metal detecting would result in the recovery of artefacts that could contribute to our knowledge of the date and cultural associations of the Saxon settlement. Unfortunately, very few artefacts were found, probably because the area has already been searched on a number of occasions. Saturday was cool and windy, but despite what was threatened there was only one, albeit very heavy, rain shower. In the morning metal detecting relocated to a field known locally as the ‘Grinch’: an area to the north of the site which locals believe contains the site of an old ford across the Meon. It is understood that this field had not previously been searched by metal detectors so the potential for recovering artefacts was high. Once again very little material was found; yet this negative evidence is important. It is known that the lower part of the field occasionally floods and given that the water table would have been higher in Roman and Saxon times it suggests that settlement would probably have avoided the area. On the basis of this we can start to reconstruct the landuse around the Roman and Saxon sites. In the afternoon the detectorists relocated to a field to the south of the building which has previously produced a range of Roman finds. As can be expected from an area that has already been detected, the finds weren’t spectacular but a small collection of Roman coins were recovered. Encouraged by the results from the geophysics, the decision was taken to move eastwards up the field and survey an additional row of 3x20m grids. By the end of Saturday the area had been completed and we waited patiently as the data was processed. The resulting plot clearly showed the area of the excavation as a rather messy looking blob characterized by a mix of high and low readings (Fig. 3, A). It is known that the end of the excavation was marked by a party and that empty beer cans were thrown in the excavation trench! It is these metal cans that probably gave the high readings. More archaeologically significant are the features shown on Fig 3. C) Three pit-like features. Possible large pits or sunken-featured buildings found close to where Saxon settlement features were excavated. E) Part of a circular feature with an ‘entrance’ to the NW. Possible circular enclosure. The geophysical surveys have been successful in identifying the wider environment of the Roman and Saxon site. The key findings are the boundaries (B & D) which go some way to revealing how the land, which was presumably farmed during Roman times, was organised. The three areas that returned very high readings (C) could be Saxon sunken-featured buildings filled with Roman ceramic material. That they appear to respect the field boundaries suggest that the settlement was taking place within the pre-existing land unit – the earlier arrangements were determining where Saxon settlement took place and this may indicate that the Saxons were farming some of the old Roman estate. Of course all this is very tentative: there is no evidence as yet to prove that the features (C) are Saxon; definitive evidence can only be provided through excavation. Overall, the results from Shavards Farm are very interesting, but as is often the case in archaeology they raise more questions than answers. The area clearly has potential as revealed by the fact that the full extent of the features have not been mapped. As the area lends itself to geophysical survey so well a follow up survey may well be scheduled. The experts enjoyed the two days they spent at Shavards Farm and we would like to thank all the volunteers for their hard work and enthusiasm.